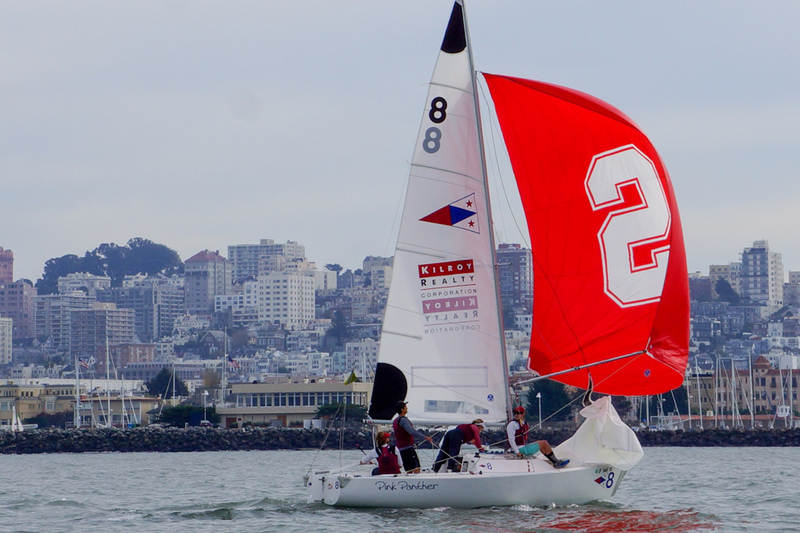 With the Golden Gate Bridge and Alcatraz as the back drop enclosing the racecourse, the Stanford sailing team enjoyed its 10th consecutive Big Sail victory at the St. Francis Yacht Club in San Francisco on Tuesday . The competition, involving both alumni, young and old, and current varsity athletes, allows for older generations to relive the rivalry, while the younger sailors are able to compete with the rivalry fresh on their minds. With the sounds of the Leland Stanford Junior Marching Band mingling with that of Cal’s Straw Hat Band in the background, the Golden Bears and Cardinal went head-to-head in match racing style in an annual race as part of Big Game week, an event that was made all the more entertaining for all Cardinal spectators when a Cal young alum sailor fell overboard in the middle of the race course while his boat was trailing. Four divisions competed for each school in a best-of-three racing series around the Bay, with the Big Sail trophy waiting to be claimed back at the festively-decorated Yacht Club. Although collegiate sailors are typically accustomed to sailing in smaller, two-person boats, and usually race in team or fleet style as opposed to match racing, the teams used J-22’s, intermediate small keel boats, that provide for quick acceleration and allow for three to four sailors. The races started just seven minutes apart from each other, so generations of Cal and Stanford sailors crossed paths in a whirlwind as they battled to win their respective races. The young alumni teams (39 years and younger) kicked off Big Sail first, with the masters (40-59 years) and grand masters (60+ years) following and the current varsity sailors finishing off the day. Despite imperfect wind conditions, with breezes blowing inconsistently throughout the early part of the day before picking up after the races had already concluded, the sun was shining and the temperatures were more than bearable from the umpire’s boat. Although the Card took home the trophy with wins in the varsity and young alumni divisions, concluding another decade of Stanford dominance over Cal on the water, the Cal masters and grand masters held their own for the Golden Bears and officially ended Big Sail in a split. The stronger boats were evident from the start, as neither division made it to a third race and instead were able to sweep. The Stanford varsity boat was comprised of all seniors, including co-captains Chung (trimmer) and Haley Kirk (pit), with skipper Hans Henken and bow Max Kohlman. Whereas the Cardinal compete on the east coast against the best crews in the nation, and only marginally prepares for the rivalry regatta, Cal fields a team that operates as the school’s second-oldest club sport. The advantage in experience in terms of training and competition for the Card was evident from the get-go, as Stanford was able to beat the Cal varsity boat handily in both races, appearing to move faster and tack crisper. Though both teams battled equally in the pre-start, vying for position and playing with fire by attempting to trap each other away from the start line, it was the Card that pulled ahead early on after the start and never looked back. In the second varsity race, Cal’s skipper got aggressive with trying to hold Stanford out in the pre-start, but Stanford was able to get out from underneath Cal and avoid the hold-off. After the start, it appeared that Stanford was just the faster crew, and mid-way through the race, Cal was rounding the leeward mark at the bottom of the course as Stanford approached the windward mark on its way back to the finish line. The Big Sail trophy, after being passed around, figuratively and metaphorically, since the 1940s, will remain at the Stanford boat house for another year. Now it’s up to the Stanford football team to ensure that the coveted Big Game Axe remains on the Farm as well.